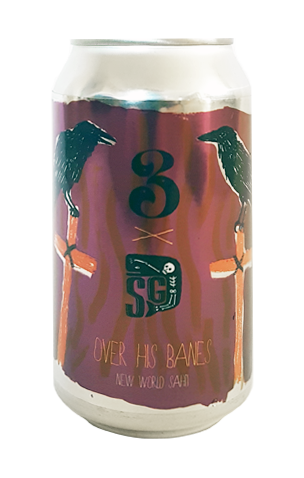 Considering both breweries have a penchant for creating unusual beers that make full use of foraged and left of centre ingredients, it was surely only a matter of time before Sailors Grave and 3 Ravens brewed a beer together [Don't forget the head brewers' shared passion for long beards – Editor]. Over His Banes takes its name from the Scottish ballad Twa Corbies which was itself based on the English folk ballad, The Three Ravens. The Scottish version is somewhat darker than the original, a fact that seems fitting since the beer was brewed in South East Gippsland in the depths of winter. The chosen style was sahti, a Finnish beer that’s traditionally flavoured with juniper instead of, or in addition to, hops. Making use of the same grain bill as 3 Ravens’ Juicy IPA and yeast from South Yarra’s Tivoli Road Bakery, for this sahti the focus is on native botanicals lemon myrtle and the Geraldton Wax flower. In the resulting beer’s aroma, it’s the lemon that’s most distinct but there’s also a kaffir lime leaf fragrance. Similar to the Wild Ravens Sourdough Ale, it’s a beer that serves up a fruit medley with a bright lemony and green grape acidity mixes in with something herbal and peppery.